At the centre of the home, the spacious living room has been decorated delicately and snappily, with central features standing out amongst minimalist white oak walls and white travertine floors. Some of these such central features include the white and silver bar, the light grey Poliform sofa in the centre of the room, the white Foscarini floor lamp, and the black B&B Italia chair. A black and white B&B Italia rectangular dining table and Poliform dining chairs also stand out in the dining room where they enhance the style stakes. More first-rate designer brands also run into the kitchen as well, which is equipped with Varenna cupboards and Miele kitchenware. Off from the living room there is a practically-arranged multi-functional family room which was designed as a transformable space that can be used as a guestroom or storage room when the door is closed, or as an open room directly connected to the living room when the door is opened. High points in this room include the black and white tree shadow themed wall behind the sofa and the black dotted graphic carpet. Located next to the family room, the master suite features the same textured white oak from the living room, but here it is complemented by a pure white themed wall. A large Poliform master bed and wardrobe come in alongside a generous amount of space plus an eclectic black Poliform single chair and a Karboxx floor lamp. Connected to this bedroom is also an en-suite bathroom, and this room features a white oak decorated Agape wash basin, hanging cabinets, plus stylish black Steinberg high-end bathroom equipment. 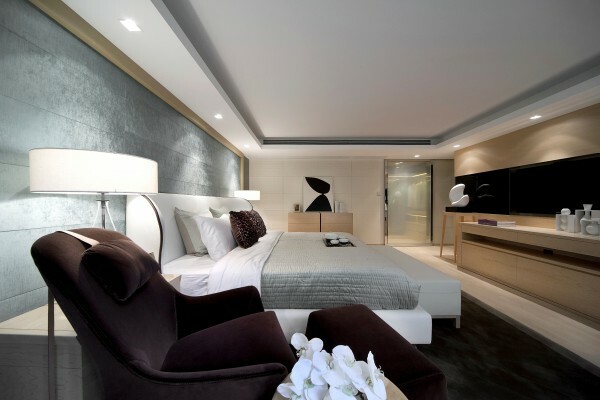 The other two bedrooms of the home were themed with white and black tones respectively. While the pale oak themed wall of the white room is embellished with a grey-tinted mirror and a black and white painting, the black bedroom employs a black wall, a black bed and a black carpet, which create a sharp contrast against the white desk and ceiling.